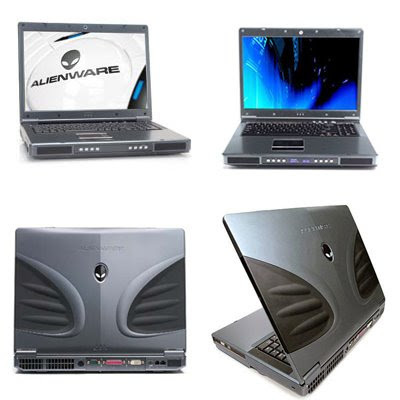 Flashback year 2006, everyone in the computer world got stunned as Alienware unveiled their new breed of customizable gaming laptop, the Alienware Area 51. Back then, this gaming laptop was hands down every gamers' dream for a gaming laptop. If not for its steep price back then, everyone would probably work double jobs just to get their hands on this formerly jaw-dropping gaming notebook - including myself. What more could a gamer ask for in a gaming laptop? What game or 3d application do you think would not be running without a snag on the Alienware Area 51 M7700's 3.8 GHz of hyper threading raw processing power provided by Intel's Pentium 4 processor? Add Nvidia's GeForce 7800 GTX with 256mb of dedicated memory for stunning visuals. Not to mention its 4 GB of PC5300 DDR 2 of ram. And of course, nobody with a right mind would settle for less than 7200 rpm for a hard drive given you already have all the previously mentioned top performing specs. Definitely not I! Oh well, those were the days when all I could do is daydream on getting my hands on the world's best gaming laptop. Luckily for me, the time for daydreaming is over. Even with our present economic challenges, I have managed well enough to be able to finally get myself the gaming laptop that I deserve. Ok. Now here is the funny part. I finally got enough cash to splurge on my dream gaming laptop right? So shopping I tried to do. And guess what? Alienware does not sell my dream no more! How ironic. How ironic indeed. I guess my dream will have to remain a dream for a little bit longer - Oh yes! I definitely am not giving up on this baby! After countless hours trying to get quality information from Alienware's customer support on how I could get my hands on the Alienware Area 51 M7700, I gave up on the Alienware's horrific customer service and I took a step back to assess what options I got left in getting what I have dreamed of. Then it hit me. EBay! There, I finally found one Alienware Area 51 M7700! Right then and there, I almost purchased it outright specially with it's less than $ 1,000 price tag. Lucky for me I did not let my emotions get the better of me. I checked on the details of the unit being sold by this EBay seller. It does look like it's in excellent condition; I will give the unit that. However, the configured specs are a little low for my taste. And the worst part? No option for a warranty! Oh no! Definitely not going with that one now. Not unless I want to end up going bald for issues that might arise after buying the rig. Just when things seemed too dark, a light shined at service.ztronics.com. They had some of the few Alienware Area 51 M7700 left on the planet. And not just that. There units are configured even better than how I dreamed it should be years back. And the best part? They have a 1 year warranty as an option. Need I say more? At long last, I'm off gaming with what the critics and gamers alike dubbed as the best gaming laptop for months on end. All thanks to everyone at service.ztronics.com specially their top-notch customer service! Alienware Laptop Expert writes regularly about computer related topics. Hope you enjoy this article. For more information on Alienware Area 51 , Alienware m7700, Alienware Motherboard Repair, alienware area 51 laptop, alienware motherboard, m15x, m7700 visit : http://service.ztronics.com or contact : 714-979-9877.